​Watford pair Troy Deeney and Christian Kabasele have both lifted the lid on the racist abuse they have suffered in the wake of the Hornets' FA Cup semi final win over Wolves on Sunday. Watford booked their place in a first FA Cup final since 1984 after completing a miraculous comeback to beat Wolves 3-2 in extra-time at Wembley, having been 2-0 down with a little over 10 minutes of the tie left to play. 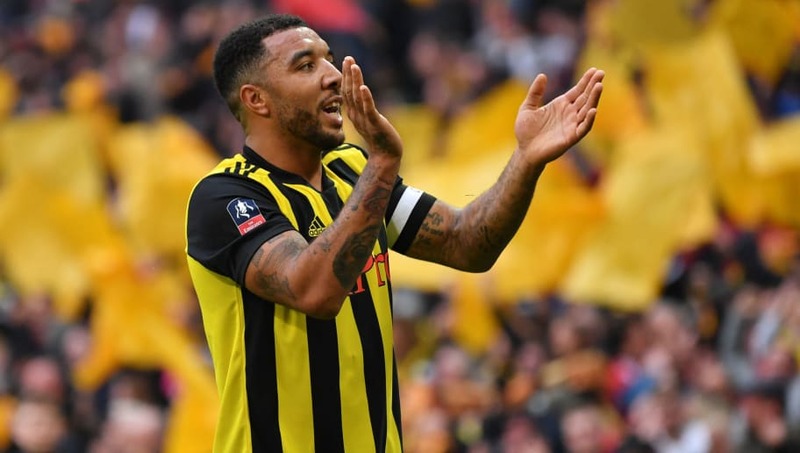 Deeney himself converted the dramatic 94th minute equaliser that forced the game to continue, but the Watford captain has taken a stand against racism on social media after the torrent of abuse he and his family have been subjected to in the days since. Taking to Instagram, Deeney shared an image of the slogan from the ongoing 'No room for racism' campaign and informed followers that he will be turning off comments on his posts. "Due to events from the last 24 hours I will be taking comments off my posts," he said. "To me this isn't a game, when you racially abuse my family or myself I have to take measures to prevent young people seeing these comments and thinking that it's acceptable, and having to expose people I care about to these small minded people." Centre-back Kabasele has also taken a stand against the racist abuse directed at him following the weekend. The Belgian defender posted images of direct messages he had been sent via Instagram, including monkey and banana emojis and atrocious racial slurs. Sharing the screenshots on Twitter, he tagged @Instagram in a follow up tweet to try and bring the abuse to the attention of the social media giant. England players were subjected to horrific racist abuse during the recent Euro 2020 qualifier in Montenegro, but the number of players speaking out since then has shown how much of a problem it remains in English society and online, rather than an issue limited to overseas. Campaign group Kick It Out shared just a few images of racist abuse directed at Crystal Palace star Wilfried Zaha and Liverpool's Mohamed Salah over the weekend, while Wigan condemned racist abuse directed at Nathan Byrne, and Northampton player Timi Elsnik revealed some of his teammates were subjected to racist abuse by a man prior to a game in Nottingham. Tottenham defender Danny Rose hit the headlines last Friday when he spoke out against continued racist abuse and failure to combat it, admitting that he 'can't wait to see the back of [football]'. Crystal Palace winger Andros Townsend supported Rose and urged more to follow his lead, although he himself revealed that such abuse is fortunately not something he has personally experienced. "We need more players like Danny to come out, be honest and speak the truth, to say what they really feel. Danny's an incredible person - hopefully the system can help Danny and he can enjoy his football again," Townsend is quoted as saying by Sky Sports. Manchester City winger has Raheem Sterling has been one of the most prominent anti-racism figures given the abuse he has received. The star took a stand in Montenegro by cupping his ear after scoring, showing the perpetrators that their chanting could not bring him down. And while walking off the pitch is a tactic that has been advocated by some campaigners, Sterling has disagreed, insisting that continuing to play, and play well, in the face of such cruel adversity is the best way to beat the racists. "I wouldn’t personally agree with [walking off the pitch]," he said. "At the end of the day, I would rather go and win the game because that would hurt them even more. They're trying to get you down, if you do walk off the pitch as a group then that makes them win. If you score a goal to win the match, then that’s even a better feeling which beats them."